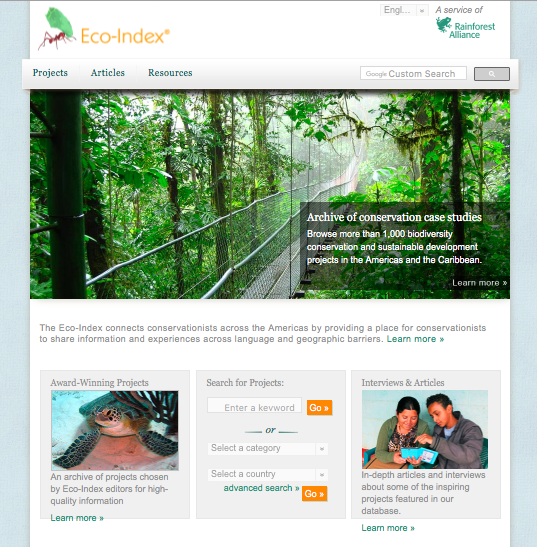 The Eco-Index® is a vehicle for government agencies, conservation organizations, and research institutions in the Americas and the Caribbean to share their experiences, learn from their colleagues, avoid the duplication of efforts, and disseminate their findings in a succinct and consistent format. In order to distill the most useful information available on Eco-Index profiles, each month the Eco-Index staff reviews the projects that have been added or updated on the site, and chooses three profiles to win one of its “Eco-Index” awards– “Innovative Eco-Initiative,” “Best Lessons Learned,” and “Best Monitoring and Evaluation” (http://www.eco-index.org/new/awards). The Rainforest Alliance’s Eco-Exchange (Ambien-Tema in Spanish) newsletter informs the conservation community about innovative biodiversity conservation and sustainable development initiatives in the Americas and the Caribbean. “Stories from the Field” shares interviews with conservationists about their experiences, lessons learned, and successes. “On the Record” features compelling interviews with key conservation leaders on a variety of topics. The Eco-Index’s “What’s New?” page (www.eco-index.org/new/index.html) is an electronic environmental magazine. The “Interviews & Articles” section features Eco-Exchange (Ambien-Tema in Spanish), a newsletter in publication since 1991 that informs the conservation community about innovative biodiversity conservation and sustainable development initiatives and success stories; “Stories from the Field” feature, which shares interviews with conservationists about their work in the field — their experiences, lessons learned, and the rewards of their work; and “On the Record,” which features compelling interviews with key conservation leaders on a wide variety of topics. The “Resources & Data” page is home to the “In Print & Online” feature, which provides short reviews of conservation reports and studies available at no cost online. “Recommended Links” features reviews of up-to-date and useful websites. Each profile posted on the Eco-Index® is submitted and updated each year by project directors. Before any information is posted on the site, it is carefully edited and translated by the Eco-Index staff, conservation professionals with years of experience, to ensure that the information is as high-quality and useful as possible. Since its launch in February 2001, the Eco-Index has added more than 1,250 profiles of projects conducted by more than 850 organizations, with an average of 20 added or updated each month. The Rainforest Alliance works believes that the best way to keep forests standing is by ensuring that it is profitable for businesses and communities to do so. That means helping farmers, forest managers and tourism businesses realize greater economic benefits by ensuring ecosystems within and around their operations are protected, and that their workers are well-trained and enjoy safe conditions, proper sanitation, health care and housing.